Lack of toilet facilities is a reason cited by many people on why they don't go camping. The lack of being able to go, especially to do Number 2, can be a big issue, and rather than have to dig a hole, some people just won’t venture beyond their home. It’s an issue that we have discussed a few times on our site. I, myself, in the past, had refused to go places because of lack of a toilet, so I do understand why some people are fearful of needing to go, and not being able to find a suitable spot to do so. There are a lot of options for toilets for the outdoors, and one of the newer options that we are seeing is the use of products, which come in a bag, and Ezygonow is one of the newer entrants to this market. When we were asked to review the Ezygonow GO Anywhere Toilet Kit we were interested to see what it’s all about! · A waste collection bag, exposing the powder (which encapsulates the solids and controls odour and something to break down the waste). 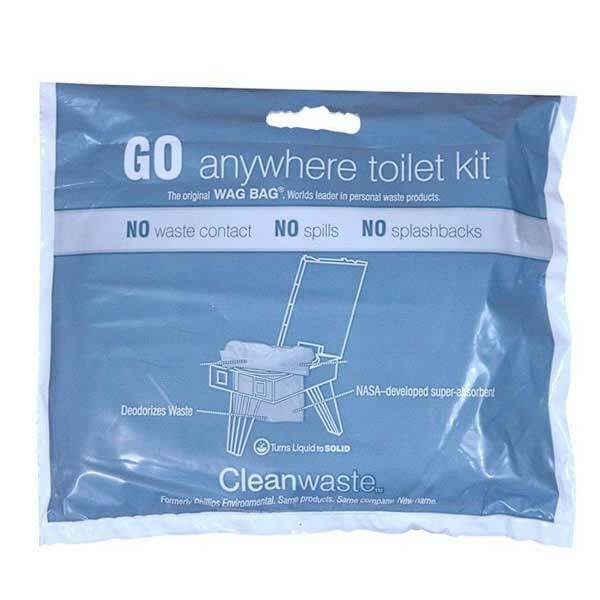 When its time to go to the toilet, you set up the waste collection bag in an appropriate spot (it might be in a Porta Pottie itself, or over a toilet seat/bucket – whatever you are using to support the bag). Then you do your business in the bag. Now if you haven’t done a wee at the same time, then you might need to add a little bit of water to activate the “poo powder”, but hopefully you can do both 1 and 2 at the same sitting. Then when you are finished, and used the toilet paper, everything gets wrapped up and put in the special ziplock bag provided. Next step is to dispose of SAFELY. This does not mean burying it, putting it down drop toilets or any toilet, or leaving it for someone else to find. So where to put it? In a bin. It’s changing your mindset a little about doing it a bag I have to admit. But then again, first time I used a Porta Pottie, that was a bit weird too, as I knew, that the next day, I would be in charge of emptying it! At least with this system, I do not have to see it all emptied the next day. If you are not near a toilet, especially at nighttime, knowing that you can put something like this over a bucket, or a toilet seat stand is a comfort, because not everyone is going to want to dig a hole at night in the bush. If you can dig a hole – then that is great, but I know from experience, its not ideal, especially if you have an upset stomach, and need to access some sort of toilet facility without having to travel great distances. Depending on where we travel, we sometimes do take the portable toilet – and that does take up a lot of room. I would recommend placing it over some toilet seat option/bucket which you would need to bring - otherwise you would just be squatting on the ground – and in that case you might as well be digging a hole. You can re-use the bag (before you seal it all up), but you need to have more of the Poo Powder handy, so that is another purchase you need to factor in, and have to carry. I am not sure I would use it more than once, but I suppose you could. We looked at this product from the family camping perspective – not the bushwalking, overnight hiking experience. In some instances in hiking, there is the philosophy of what you take in, you take out – which includes your toilet waste, and that isn’t something I have had to do on my overnight hikes. But this would be an alternative if you were in an environment which required you to do so. This product definitely has its benefits as an emergency toilet. It’s not something I would use on every camping trip, but maybe just keep in our utensil box should we need it one day. For those people who do have a fear of camping without a toilet, this may alleviate some of that concern, knowing that if they have a pop up shelter and bucket, with the Ezygonow product to use…..but that is going to be an individual thing and depend on their level of comfort in having to defecate in a bag. For pricing and further product information, please go to Ezygonow website.